I reordered my question a couple days ago but did not upload my previous result that I got with the old questions. When I tried to upload all of my results today, all results with the new question are uploaded, however, the other result with old questions cannot be uploaded. There is a notification that "the server encountered a problem uploading the data". Does anyone encounter the same problem? Is there any solution for this? I really need the data, because re-measurement is impossible. Thank you and looking forward to any response. I have encountered similar problems with uploads. With me, it may have been my own error such as numbering a site sample. If the little green cloud at each measure pops up on your phone in the field, the measure has been uploaded. If you are having trouble finding it when your uploading data try just using the date, that has worked for me. Load the date you took the measure and see if they are they. Thank you for the response. However, I still do not understand how an error in numbering a site sample could relate with uploads? Could you please explain more about that? The green cloud has not popped up so I am pretty sure that it has not been uploaded. Furthermore, I did another measurement today and tried to upload it and I just had the same problem. I attach the screenshot so that you can see what problem I am facing. Did you encounter the same notification? and did you manage to solve that? or Is there any other way to move data from the app to the web? Looking forward to your reply. Thanks in advance. Thank you for posting this screenshot, it helps better understand your issue. Yesterday I went in to a test project, took measurements, and had them cached on my phone. I then went into my project and both added a new question, and reordered them. Went out, took more measurements and was able to upload all them afterwards. So I was unable to recreate it myself yet. Can you give any more details to what you did/changed between your measurement section, it was unclear if you had just reordered questions, made a new one or both. Any additional information would be helpful to resolving this issue. Thank you for your response. What I did was deleting some questions, adding some new ones and reordering them. I think the difference with your test project is at the part of deleting some questions and maybe that was the problem. Hopefully, there is a way to solve this. Thank you very much for your help. Ah! The plot thickens! I will continue my investigation today and see if I can reproduce your issue. Problems are much easier to fix when we can identify and reproduce them. Hope to get back to you today with an answer. I'm not sure how to explain the issue I have had in the past as it could have been my fault. With my projects, I have a question for site sample and site detail I have had a couple of samples that didn't show up but they definitely loaded with the green cloud. I could find them by filtering the date. Sean well done figuring it out, mate. Thank you for the reply. I really hope that Sean and his teams can fix the problem. Did you and team manage to fix the issue? I tried it again today, but everytime I tried to upload the data, the app suddenly closed with a notification "unfortunately the app has stopped working". Do you know how to deal with this new problem? Looking forward to your reply. Sorry for the delay! We are working on the issue, but we have not resolved it yet. Does the error message you mentioned only occur when you are trying to download the stored data, or does it occur when trying to collect or upload new data? Thank you for the reply. Please keep me informed when it is solved. Regarding the error message, previously it happened everytime I wanted to upload new data. Now, it also happened while I was doing the measurement. Any idea about this problem? I just experienced this in the past few days, it worked well before. Our technical support team has been working on correcting this issue and have successfully found a solution. You should now be able to submit your data without issue. Please let us know if you have any further problems. I seem to be having similar troubles with upload after a change in question. I missed typed a genotype name in my project, corrected it and have been unable to upload some data collected. I had resolved to live with that data point as missing when I searched the forum to see is anything can be done. I reverted back to my the mispelt genotype but was still unable to upload that time point's data. I have taken more measurements after that which uploaded successfully. Can anything be done so I don't lose that data? to help you, could you please give us the link to the project or its name. I looked at project and found that month 4 restored (Month missing previously) for most parameters. I however found that for LEF month 4 still appears blank. Thanks for looking into this. I looked at your issue is the following. The last set of measurements, as far as I can tell were taken with a different protocol called Leaf Photosynthesis MultispeQ V1.0 800 umol JRP. Looking at the Macro Leaf Photosynthesis MultispeQ V1.0 at 800 umol JRP that does the calculations, it does not output the parameter LEF, but LEF_800. You can find that parameter, by activating the Advanced Parameters. I was able to find LEF800. I have used this protocol for 3 time points so far and all 3 have LEF800 values. Two of the three however also have LEF values. Only the time point with the upload issues lack the LEF values. Is there away to get LEF values for month 4? Or is can I get LEF_800 for the 2 months I didn't use this protocol for? I will like all months to have same type of LEF values. 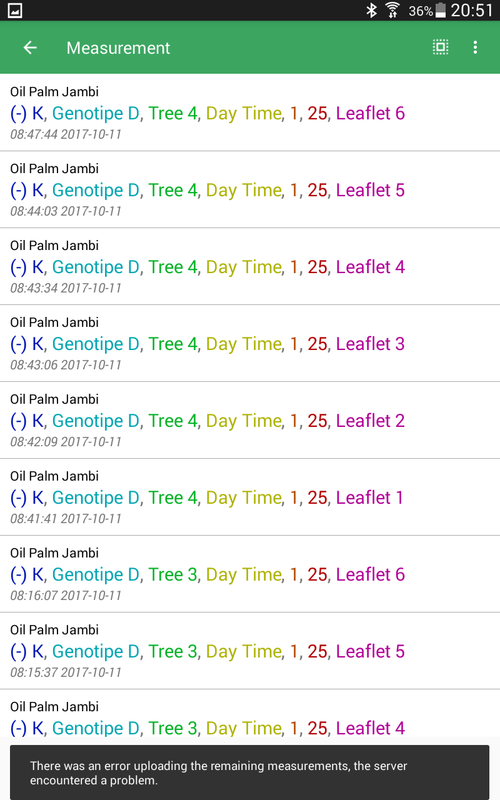 so I checked your project (Cassava_Field_Monthly_root_harvest) which has 200 measurements. 109 measurements were taken with the protocol "Leaf Photosynthesis MultispeQ V1.0", all of them containing a value for LEF. The rest of the measurements 91 taken with the protocol "Leaf Photosynthesis MultispeQ V1.0 800 umol JRP" have the parameter LEF_800. I'm not sure what you mean by timepoints and I can't see where values are missing. Perhaps you can send me the link to a single measurement as an example. When you want to change the parameter name LEF_800 you have to contact the creator of the protocol. Just follow the link to the protocol in the post above and find the user.